s photo shows the airplane during its first flight. EVERETT, Wash., April 25, 2012 /PRNewswire/ -- Boeing (NYSE: BA) has delivered the first 747-8 Intercontinental passenger airliner to Deutsche Lufthansa AG, beginning a new era for the world's most recognized airplane, and beginning a new era of increased efficiency, stronger environmental performance and greater enjoyment for Lufthansa and its passengers. "Lufthansa and Boeing have a long and proud history of working together to bring new innovations to the airline industry," said Jim Albaugh, president and CEO of Boeing Commercial Airplanes. "We are grateful for Lufthansa's inspiration and leadership in helping us design a new Queen of the Skies for the 21st Century, and I'm proud of what Boeing employees have accomplished by bringing this great airplane to Lufthansa and the world." "After working together for many years, we are very pleased to have the newest generation of four-engine aircraft join our fleet," said Christoph Franz, chairman of the Executive Board and chief executive officer of Deutsche Lufthansa AG. Lufthansa employees will conduct airline-specific preparations to get the airplane ready for a May 1 flight to its permanent home base in Frankfurt. Boeing will host a special flyaway celebration with senior executives from both companies that day. 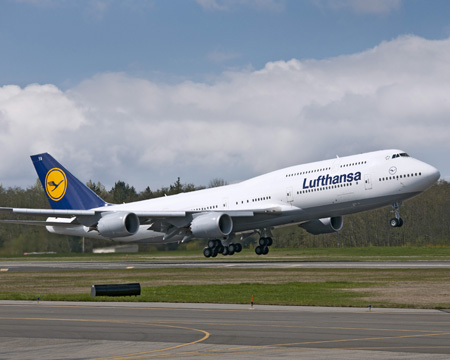 Lufthansa will then host a special celebration when the airplane arrives in Frankfurt on May 2. Details of those celebrations will be announced soon. The 747-8 Intercontinental will bring double-digit improvements in fuel burn and emissions over its predecessor, the 747-400, while generating 30 percent less noise. The 747-8 Intercontinental's Dreamliner-inspired interior includes a new curved, upswept architecture giving passengers a greater feeling of space and comfort, while adding more room for personal belongings. It is powered by GE Aviation's GEnx-2B engines.